Katie finishes with CBS Thursday. Larry's been off CNN since December. Regis will spend mornings with Kelly into November, but Meredith's last "Today" with Matt and Al is just weeks away. 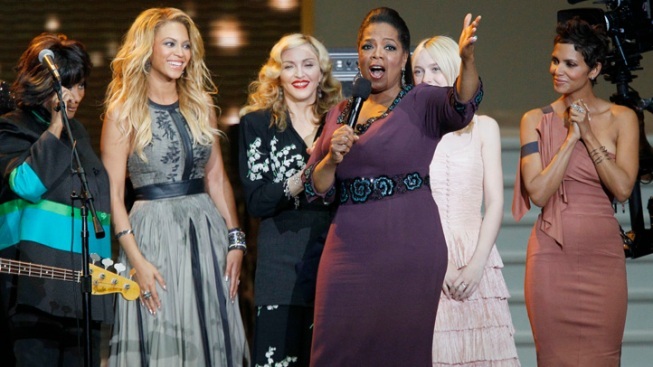 And of course, the biggest one-name-says-it-all TV talk star of them all – Oprah – just finished taping her daytime talk show finale, in which she was feted by fellow mono-moniker superstars like Beyonce, Madonna, Halle and Aretha. The reasons for the spate of departures range from network pressure to personal issues to contract expirations to age to new aspirations. But the changes in TV talk and news – and hybrids, in some cases – add up to yet another shift in the media landscape. We're moving further away from mass audience shows, hosted by familiar figures with whom a wide spectrum of viewers are comfortable enough to be on a first-name basis (though Ellen seems to be dancing on solid ground). We might not quite be at the end of an era – but Couric and Winfrey may be the two most important figures to keep watching for signs of where we’re headed. Couric, whose five-year stint anchoring the "CBS Evening News" was hampered by low ratings during a time of network audience shrinkage, appears set to go the Winfrey daytime talk-show route, even if her approach likely will be newsier. Winfrey, meanwhile, is moving from the mass audience approach to niche viewership with her Oprah Winfrey Network talk and lifestyle cable channel. OWN has posted modest ratings posted since its much-ballyhooed January debut and recently underwent a management shakeup. But time and Winfrey's increased presence could prove a boon – or, ultimately, proof that the network will never be a raging success. Her effort is well worth a try, as is what we expect will be Couric’s new take on an old genre. The future of TV news and talk shows – and the new forms they may take – is unclear, especially amid competition from the Internet. Winfrey and Couric’s new ventures could be the best harbingers of where the conversation is moving.